One of the big "buzz words" in our recent, immediate culture has become the word "hack." There are websites even devoted to "hacking your life." Check out www.lifehacker.com as an example. The term life hack refers to productivity tricks that computer programmers devise and employ to cut through information overload and organize their data. In more recent times, the same phrase has expanded to any sort of trick, shortcut, skill, or novelty method to increase productivity and efficiency, in all walks of life; in other words, anything that solves an everyday problem in a clever or non-obvious way might be called a life hack. In a previous post a few weeks ago, I mentioned the fact the my wife and I are in the process of paying off a considerable amount of debt as quickly as possible. 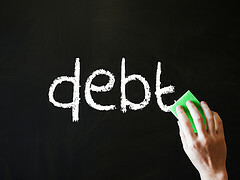 See this post: Working the Debt Snowball Again, Take 2. We're both Financial Peace University students and completely understand the principles of the debt snowball. There are also many other great experts in the area of personal finance who have additional ideas regarding money management and debt reduction. As a result of this collective expertise, we are employing four money "hacks" to get out of debt as fast as we can. Honestly, none of these four methods is anything new and novel. As a result of studying various personal finance approaches, I have found these seem to fit our lifestyle and personality really well. Multiple streams of income. We are using whatever means necessary to bring in additional income to our regular salaried positions. Second jobs, selling stuff on Craigslist, garage sales, and so on. The bigger financial "shovel" you have, the faster you can dig your way out! Squeeze down on the budget. In FPU, Dave Ramsey discusses the use of both estimated budgets and allocated budgets. Estimated budgets are just that, estimates on your cash flow. Allocated budgets deal more with actual money spent per week and/or per pay period. I do more of a hybrid approach of a "living, changeable document" where I run an estimated budget at the beginning of each month. Then, I tweak a few specific variable categories (such as gas) over the remainder of the month. As I close out the month and prepare to do my next month's estimated budget, I make sure these variable categories are no longer estimates and now hard numbers. I wring out of our budget all the extra money and put all extra money toward our next smallest debt in our debt snowball. Use automation and extra payments. I pay all of our bills electronically, including our last couple of remaining debt payments. The minimum payments are on autopilot. I then make one massive additional principal payment toward our next smallest debt in the snowball at the end of each month. This system seems to have worked really well in paying down these debts quickly. Use cash and only go shopping when absolutely necessary. I know this can be a challenge for many, especially if you have a spender personality. In my mind, though, this is all the more reason to avoid shopping like the plague! Spending only with cash registers greater "pain" than debit or card cards. Limit your shopping trips and only use cash. What Hacks Do You Employ? Are you in the process of digging your way out of debt as well? Are you using similar money hacks to get out of debt as quickly as possible? Have you discovered any additional money hacks on your debt free journey? Tell us your story and give us your experience on utilizing money hacks.